in Beeline Skin Care’s beeswax and honey moisturizing creams, and other products made here in NH. There will be multiple skin care products to try and to purchase for both women and men. 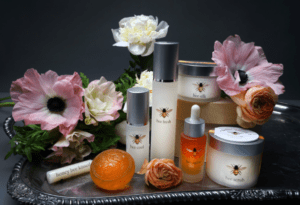 Beeline LLC is a small, buzzing manufacturer of natural skin care products located in Henniker, NH. Beeline products are made with beeswax and honey from local beekeepers. The line includes natural moisturizing skin creams, stress relieving skin mists, soaps, facial scrubs, soothing lip balms and an award winning lotion candle. Just recently Beeline has introduced new therapeutic products made with CBD beeswax and honey. Beeline’s CBD products offer relief from the pain associated with arthritis, joint and muscle pain, neuropathy, inflammations of the skin such as eczema, psoriasis, acne, and dry itchy irritated skin. Beeline LLC is a lifetime member of the NH Beekeepers Association – a portion of Beeline profits are donated to the Honeybee Research fund. Catch the Buzz and Give Bees a Chance!